Humphrey Davies and Lesley Lababidi's new book offers a richly intriguing map of Cairo's enthralling history through its street names. A Field Guide to the Street Names of Central Cairo, by: Humphrey Davies and Lesley Lababidi, (Cairo: AUC Press), 2018. 252pp. 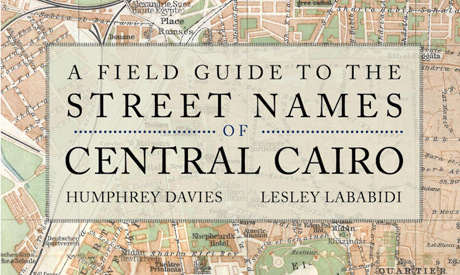 The American University in Cairo Press has released a new book titled "A Field Guide to the Street Names of Central Cairo" by the renowned translator Humphrey Davies and blogger and author Lesley Lababidi. The book offers a richly intriguing map of Cairo's enthralling history through its street names. His book focuses on the part of the city created in the wake of Khedive Ismail’s command, given in 1867, to create a “Paris on the Nile” on the muddy lands between medieval Cairo and the river. A Field Guide to the Street Names of Cairo lists more than five hundred current and three hundred former appellations. Current street names are listed in alphabetical order, with an explanation of what each commemorates and when it was first recorded, followed by the same for its predecessors. An index allows the reader to trace streets whose names have disappeared or that have never achieved a popular status.